Biotin localizes to the parasitophorous vacuole. Trophozoite-infected erythrocytes were permeabilized with SLO, biotin-labeled, and spread onto microscope slides. 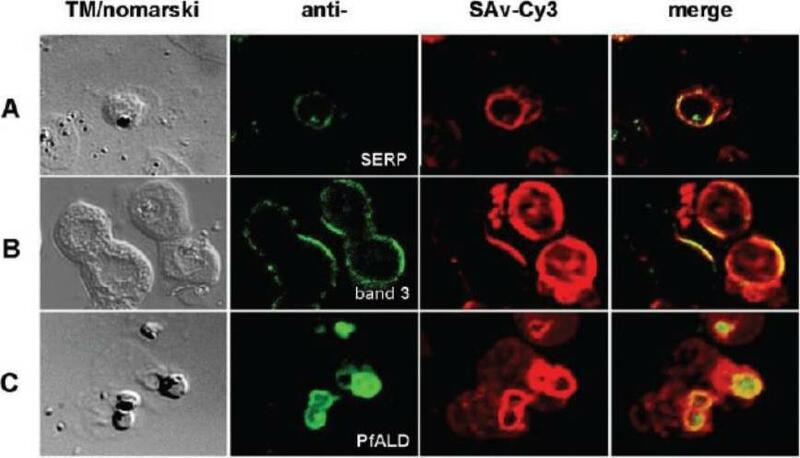 Cells were fixed and incubated with antibodies to SERP (A), a vacuolar resident protein. Conjugated secondary antibodies (green color) co-localize with Cy3-conjugated streptavidin (red color). B and C show dual labeling of biotin and the erythrocyte membrane protein band 3 (B) or of biotin and the parasite cytosolic protein aldolase (C). Cells were imaged using a laser scanning confocal microscope. The left panels (TM/nomarski) show the transmission images of the respective fields, and the right panels (merge) show an overlay of fluorescence images for each of the antibodies used. 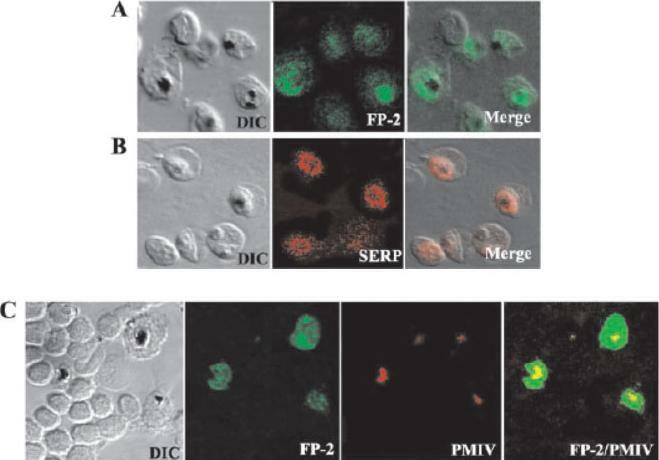 The images show a distinct ring around the periphery of the intracellular parasite. The biotin co-localizes with the vacuolar marker protein SERP (A). This location is distinct from the location of the erythrocyte membrane protein band 3 and from the location of the parasite cytosolic protein aldolase (B and C). A ring-like staining around the periphery of the parasite can be attributable to a reaction of the biotin with membrane proteins of the PVM and with soluble vacuolar proteins.Nyalwidhe J, Baumeister S, Hibbs AR, Tawill S, Papakrivos J, Volker U, Lingelbach K. A nonpermeant biotin derivative gains access to the parasitophorous vacuole in Plasmodium falciparum-infected erythrocytes permeabilized with streptolysin O. J Biol Chem. 2002 277:40005-11.